It's been awhile since I've read any short stories. I'm not generally a fan of the genre--you have to be Alice Munro to really pull it off (if you haven't read her Open Secrets, I highly recommend). But when Penguin sent me a review copy of Death's Excellent Vacation, a collection of paranormal short stories, I was excited to get into it. Unfortunately, I ended up disappointed. First things first: out of the fourteen stories included, only five involve vampires (and in one of those there's only minor vamp action). Nevertheless, it's worth reading some of the other stories as well even if you're in it mainly for the vampires (particularly "The Innsmouth Nook" by A. Lee Martinez and "Meanwhile, Far Across the Caspian Sea..." by Daniel Stashower). The first vampire story is "Two Blondes" by Charlaine Harris (who is also one of the editors of the book). Yes, it is a Sookie Stackhouse story (previously unpublished). Too bad it's also awful. The story revolves around Pam and Sookie (the two blondes of the title) spending a weekend in Tunica, Mississippi. What's supposed to be a vacation turns out to be a dangerous errand. Besides the preposterous premise, Harris spends way too much time on exposition and--worse--novel recaps. Given the limited number of pages you'd think it would have been obvious that more time should have been spent on story development. While the majority of "Two Blondes" is simply boring, the conclusion seems like it was created for (or by) skeezy high school boys with overwrought masturbatory fantasies. It's just bad. Harris didn't just phone this one in--she texted it. Fang File: Pale humans with fangs that extend or retract at will. Sleep during the day and can't tolerate sunlight. They greet one another by nodding (no hand shaking). Elf blood is toxic to them. Text Bite: "Pam put on her blinkers (she was an excellent driver) and following the signs, we pulled up in front of the casino/hotel where we had a reservation." The next vampire story, "One for the Money" by Jeaniene Frost, is--thankfully--much better. In fact, it's my favourite story of the bunch. An offshoot of her Night Huntress novels (which I think I'll need to be checking out soon), "One for the Money" has vampires Cat and Bones teaming up with Cat's mom (a recently turned vampire) protecting a spoiled brat heiress from the various nasties out to kill her. This is one of the better-paced stories in the anthology, which is probably a big reason why it's also one of the better stories. It also doesn't hurt that it's an interesting story with decent tension and engaging characters. Clearly Frost can work as well in shorter form as in her longer pieces. Buffy fans might get a kick in seeing Ohio described as a "supernatural hotspot" (of course it is--there's a Hellmouth in Cleveland). And although I didn't get a real sense of it here, on her blog Felicia Day has described Bones as a Spike-like character (works for me). Fang File: Heightened senses, super strength and speed. Ability to compel humans. Ability to see ghosts. Different vampires have different skills (Bones can fly, Cat can shoot flames from her hands). Sun, crosses, and stakes don't affect them. To kill you have to destroy a vampire's heart with silver. Sound Bite: "Right. And we shrink back from crosses, can't travel over water, can't enter a home unless invited, and always get staked in the end by the righteous slayer. Really, who'd be afraid of a creature like that? All you'd need is a Bible, a tanning bed, and some holy water to send us shivering to our dooms." Story number three, "Safe and Sound" by Jeff Abbott, isn't the most creative story I've ever read. It's about an obnoxious reporter named Nancy Grace Nora Dare who works for CNC ("Constant News Channel") and is obsessed with the case of a college student (Jason Kirk) who disappeared one night while on vacation on a Caribbean island. She's determined not to drop the story until Jason is found. None of the characters are exactly believable, especially when they're so exaggeratedly good or bad. It also seems to go on for too long and then rushes to the conclusion. But at least, unlike poor Natalee Holloway, Jason Kirk's story ends on a somewhat more positive note. Fang File: Vampires only come out after dark. They can feed on animal or human blood. Ability to hypnotize humans and alter their memory. Text Bite: "Nora had to decide whether to play that comment as a hurtful blow to the Kirk family or as an exciting, intriguing new twist in the story's worn fabric. She tilted her head again--she was known for the beauty and forcefulness of the head tilt--and decided the audience was hungry for a bit of the inspector's flesh." "The Heart is Always Right" is an intriguing concept--the life of a gargoyle--marred by a poor execution and a predictable, cheesy ending. At least our hero (a nameless gargoyle) is interesting and sympathetic. Vampires make only a brief appearance. Fang File: Vampires are minions of the "Big Bad" and are always found in the presence of kolthulu (squid demons). They can't speak when their fangs are out so they emit a whistling hiss instead. Text Bite: "The lights were out here in the corner of the lot. That was the first wrong thing. The next was the thickness in the rainy air, like rancid soup. Last was the shadows crowding around, and the red pinprick lamps of eyes blinking on and off. What the hell? I dropped my plastic bags and my trueform shredded out through the mask of disguise." This brings us to our final vampire story, "Pirate Dave's Haunted Amusement Park" by Toni L. P. Kelner, the other editor of Death's Excellent Vacation. The story, which does in fact feature an amusement park and a Pirate Dave, revolves around a newly turned werewolf visiting the amusement park of her childhood vacations and discovering a whole lot of sabotage going on. Teaming up with Pirate Dave (who turns out to be a vampire) they solve the mystery and find romance. There are no real twists to the concept and the pacing leaves something to be desired. The introduction is all right but everything after that is way too rushed, with no tension or build up of the story. It is, however, nice to see vampires and werewolves getting along for once. I think Kelner and Harris's stories serve to prove that editors should not include their own work in anthologies. Fang File: Human appearance. Ability to glamour humans. Super speed. Can only come out at night. Text Bite: Joyce: I thought we could go out for a bite. And for dessert we can come back here for a bite. Vampire Pirate Dave: Prepare to be boarded. Overall this is a book with a few decent stories and a lot of poor ones. If you're a diehard fan of the paranormal (there's a bit of everything to be found here, from squid monsters to gargoyles to leprechauns and even super heroes), borrow it from the library. The rest of you can feel free to give it a pass. 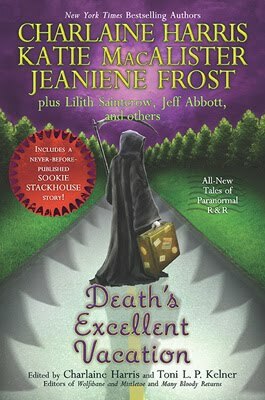 Death's Excellent Vacation, edited by Charlaine Harris and Toni L.P. Kelner. From Ace Books (Penguin).